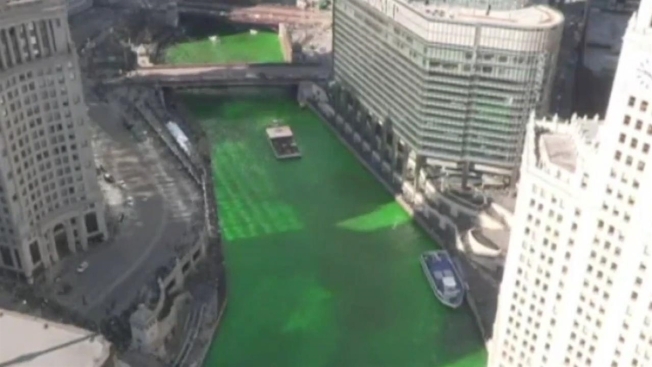 The Chicago River was dyed green Saturday, officially kicking off St. Patrick’s Day celebrations across the city. Since the early 1960's, the dyeing of the river tradition annually attracts hundreds of thousands of spectators ahead of the city’s St. Patrick’s Day Parade. When: The dyeing of the river will begin at 9 a.m. Saturday, March 17 when the boats launch between Columbus and Wacker drives. Chicago’s St. Patrick's Day Parade will follow, stepping off at 12 p.m. in Grant Park. Watch it Live Online: NBC Chicago will offer a complete live stream of the river dyeing right here beginning at 9 a.m. The stream will be available on both desktop and mobile devices, including in the NBC Chicago app. 2018 Chicago St. Patrick’s Day Parade – The city’s annual St. Patrick’s Day Parade will begin around 12 p.m. on the corner of Columbus Drive and Balbo before continuing north to Monroe. The parade will happen “rain or shine” and typically lasts about three hours.